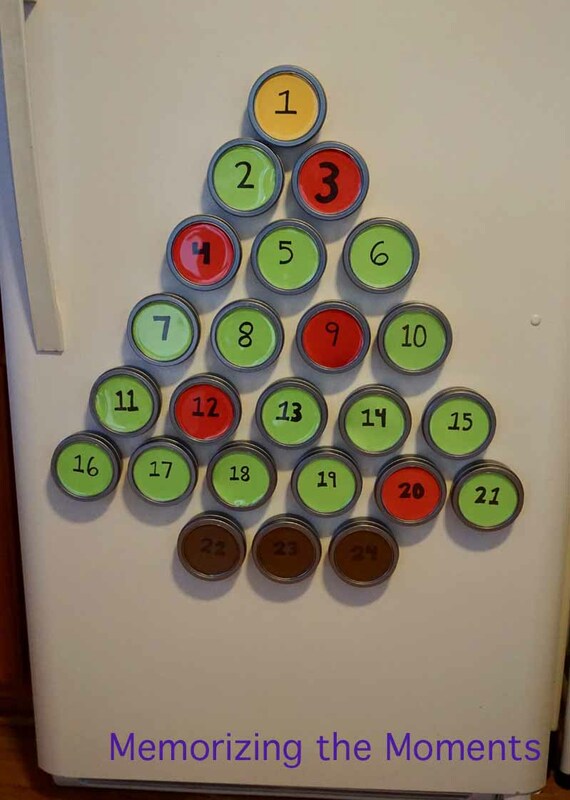 This year I really struggled with Advent Calendar ideas. We always do our book advent activity, where I wrap 24 of our Christmas and Winter themed books and Xander gets to open one each day (we've done this every year and he's still enjoying the activity at 7 years old). The last two years I've done a Lego Advent Calendar, but it required remaking the envelopes every year. He liked it, but I was ready for something different, and slightly more reusable. I used magnetic spice containers (similar to these) that I got from the Dollar Tree. I liked the Dollar Tree ones better because they were wider and shallower (and cheaper). Then I use the bottom of the container to trace circles on card stock and filled in the "tree." The containers are big enough to put a few fun sized candy bars. This year I put in some mini Pokemon figurines I got super cheap on Amazon. I put two in each container and Xander has loved opening them so far. In the future I could put other little toys, or even something for Xander and something for the new baby.